I don't know if it's only me, but I can hardly find blogs, books, or good articles to encourage women who, like me, are entering this new stage in life in which "all of a sudden" you are a mom of young adult children. Soemtimes Nancy Wilson at Femina, and Carolyn Mahaney at Girltalk have some pretty good -and challenging- stuff for us, but for the most part, what is written out there is directed towards young moms. Yesterday I shared about a book I will start reading and, God willing, blogging about starting on February 5. 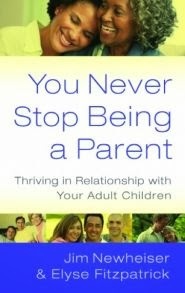 This book, You Never Stop Being a Parent: Thriving in Relationship with Your Adult Children, will certainly be a blessing to many women who are asking themselves many questions like how their role as a mom changes once their children become adults. So, today, and because I really want you to join me reading in along, and because I know some of my friends are purposely not buying any more books on 2014 (only after they finish the pile they already have at home! ), I have decided to give away one copy of this book. So if you want your name to be in the drawing, just leave a comment here. I will announce a winner next Wednesday, January 22 (USA only). And if you are not in this season of life yet, make sure to pass the voice among your friends, and don't forget to enter your name in there; if you win, you can give the book to your friend, you know she will be very happy, right?